I am as prone as anyone could be to starting a recipe with only a cursory look at the ingredients list to see if it seems plausible that it matches up with my pantry, but you’re going to want to read this one all the way through because of the exciting baking options at the end. I like the drop biscuits quite a lot; my sister (who always preferred the middle of the bread anyway) likes the less-crusty pull-apart option. Sadly for her, she missed the baking, and so all of the photos are of my kind. Let this be a lesson! 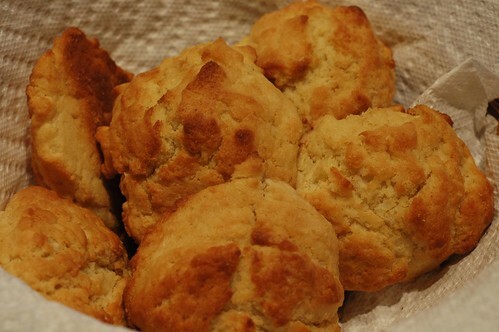 Although these are best hot from the oven, individual biscuits can be reheated in the toaster and a whole group can go in the oven for five or ten minutes, anywhere between 300 and 400 F. Normally, you cover baked goods with foil when you reheat them like this so they don’t dry out or brown, but leave these in the open — it’s a short time, and it’s essential that the crust remain crisp! Preheat your oven. If you’re baking as drop biscuits, heat it to 475 F; if you’re baking in a pan, heat to 500 F.
Melt one stick (8 T.) of the butter in a small bowl or liquid measure. Mix the flour, baking powder, baking soda, sugar, and salt in a bowl. Add the buttermilk to the dry ingredients and stir just until combined. Melt the remaining 2 T. of butter. 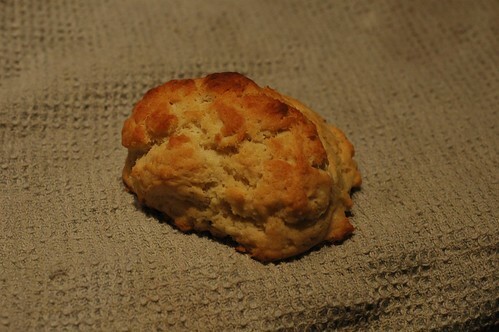 For drop biscuits: Grease or line a cookie sheet. Drop the batter on to the sheet in 12 equal portions. (Each portion should be about a quarter-cup of batter; if you’re going to measure, grease the cup first!) Brush the tops with the remaining butter and bake for 12-14 minutes, until golden brown. 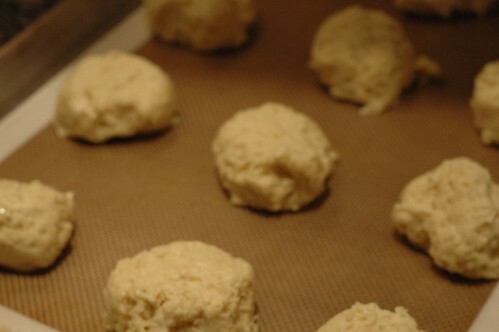 For pull-apart biscuits: Grease an 8- or 9-inch round cake pan. Divide the batter into 12 portions and roll each in flour, then add to the pan. Put nine or ten in a ring around the outside edge and the rest in the center. They’ll be squishing in next to each other; don’t worry! Brush the tops with the remaining butter. Put in the oven for five minutes, then turn the oven down to 375. Bake until the biscuits are golden brown on top and sound hollow when gently tapped (a sign that they’re cooked through on the inside), 15-20 more minutes.